Benedict “Benny” Gatto began his EMS career as a volunteer in Bensonhurst, Brooklyn 30 years ago as a volunteer dispatcher. He became a certified EMT at 19 years old and soon chose EMS as his career path. Over the course of his working life, Benny has received numerous awards, including commendations for his work during the Staten Island Ferry incident of 1995. He is a three-time recipient of the Staten Island Borough President distinguished EMS service award. Benny has been married for 23 years to his wife, Suzanne, and they are the proud parents of two teenage daughters, Maria, 16, and Nicole, 12. Benny’s hobbies include hunting, fishing, cooking, and amateur radio operations. Benny was chosen by his peers as a Star of Life for outstanding professionalism as an EMT. He is viewed as a role model due to his commitment to lending a helping hand to fellow staff, as well as his willingness to teach his colleagues. Additionally, he consistently demonstrates the very highest level of compassion for his patients. 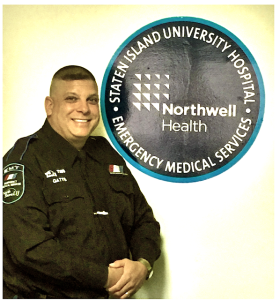 Northwell Health CEMS is proud to nominate Benedict Gatto as an American Ambulance Association 2016 Star of Life.